For the second year running, PRWeek asked agencies to submit their net profit figures so we could analyse the profitability of the sector. We asked agencies for operating profit before tax. These are more difficult to accurately compare than fee income, due to differences in agencies' accounting practices. Those who give us the data may also have unusually high margins. Last year, the Top 150 sample had an average profit margin of 14.2%. Different agencies submitted their profit figures this year, so to compare like with like, we stripped out the agencies that gave us their figures for 2010 and 2011. Margin was calculated based on net profit as a proportion of PR income. The sample was more profitable in 2011. The agencies made combined profits of £28m on an income of £158.8m in 2011 - a weighted profit margin of 17.6%. In 2010, these same agencies made £23.2m profit on an income of £144.1m, which makes a weighted profit margin of 16.1%. Below, Adam Parker, CEO of RealWire, chartered accountant and Show Me Numbers blogger, compares our sample to the public marcoms groups. The PR divisions/companies compared made combined profits of £192.7m on income of £1,216.9m - a weighted average profit margin of 15.8%. All figures relate to year ended 31/12/2011 except Next Fifteen, 31/7/2011. Chime - headline operating profit for public relations division; Huntsworth - profit before highlighted items; WPP - headline PBIT margin for public relations and public affairs; Next Fifteen - segment adjusted operating profit. The marcoms groups compared made combined profits of approximately £3.73bn on income of approximately £26.28bn - a weighted average profit margin of 14.2%. All figures relate to year ended 31/12/2011. Publicis - operating margin; WPP - headline PBIT; Aegis - underlying operating profit margin; Havas - income from operations; Omnicom - EBITA. Despite the challenging economic climate, with overall GDP growth of less than 1%, 2011 seems to have been a year of continued recovery for the PR industry, with steady improvement in both income and margins. Small and medium-sized agencies continued to demonstrate that they are just as capable as larger ones of adding value, with a number of agencies in the Top 150 outperforming even the most profitable of the quoted PR groups. However, within the overall industry performance there was significant variation at the individual agency level in both fee income growth and margins, with some agencies clearly finding conditions challenging. This may well reflect the changing requirements of clients and in particular the continued emphasis on digital media. Top 150 sample of 62 agencies achieved a weighted average profit margin of 17.6%. An improvement of 1.5% over the 2010 performance for these agencies and a 3.4% improvement over the agencies analysed in 2010. Top 150 profit-sampled agencies also grew their PR income by 10.2% on average, similar to the Top 150 overall. 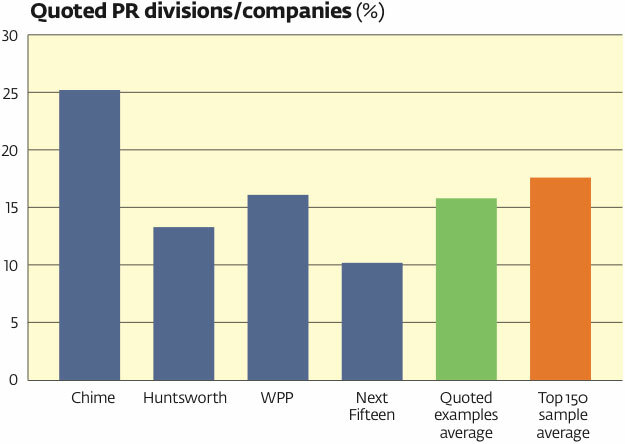 Quoted PR group sample companies experienced a small fall in profit margins overall to 15.8% (2010 was 16.1%). This was due to the impact of Huntsworth's margins falling by 3.8%. 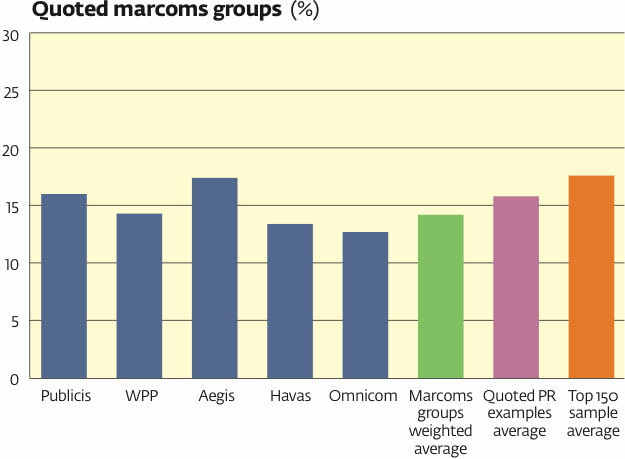 Quoted marcoms groups fared better with an increase in profit margins of 0.9% to 14.2% (2010 was 13.3%). Top 150 sample agencies' margins varied from +42.7% to -11.9%. Top 150 sample agencies' income growth varied from +121.5% to -27.6%.